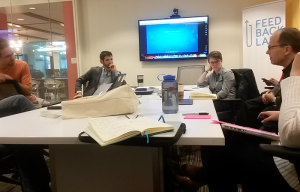 Last Thursday, Feedback Labs held a LabStorm with Josh Goldstein, CEO of the Department of Better Technology (DOBT). DOBT is a for-profit software company that aims to help governments and nonprofits improve data collection and use. I don’t fully agree with this, or at least the bullish tone of it: there is something silver-bullet-like in saying that technology will save the world. But we can and do agree, “the data revolution has a software problem.” Josh painted a picture in Dodoma, Tanzania, in which local statisticians could hardly do their job because available data was so bad. He explains that the problem isn’t so much the collection of data (this, he says, is easy even if with paper and pens) but what happens with the data after it’s been collected. Local governments are using older software with limited functionality, with basic fields that cannot be added or modified so that the collected data can be entered. Better software could definitely help collected data—feedback or other types of data— be followed and used. This is a another political problem. Politics is the use of power in society. The fact that the World Bank—and many development institutions— doesn’t sufficiently focus on project implementation is a problem of power. Why care about the proper implementation of software if, after all, you’re so incentivized to get money out the door?